We love to make brides happy! 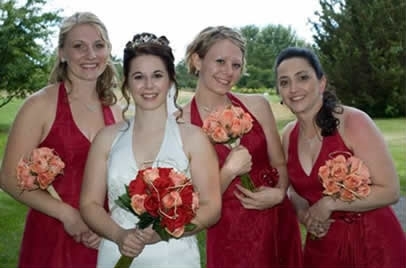 Since 2005, we have been helping people design their dream wedding bouquets using premium silk wedding flowers. Below, you will find some of the feedback we have received from brides, photographers, and husbands looking for the perfect anniversary gift – a bridal bouquet recreation. Your forever bouquet is a symbol of the type of marriage we are believing in for you – lovingly created and beautiful for the rest of your life. To be honest, I was the person that said “I would never have silk flowers for my wedding day”. However, Bryan and I decided on a destination wedding and I wanted 3 completely separate colors for bridesmaids and I wanted each to carry a bouquet of flowers that matched their given dress color. Hi Erin, thank you again for the beautiful florals you put together for our wedding! Everything looked amazing and all of the guests were really impressed with them. No one would’ve guessed that they were artificial. They also looked amazing in the pictures! I attached a couple so you could take a peak at them. My pictures are also posted on http://www.ramseystillimaging.com. I really loved the color choices that we put together and am very pleased with how the salmon looked with the red. Thank you very much for suggesting that combination! I really appreciated the open line of communication you held between us. It was really nice to have you on top of things and emailing me with updates. I really enjoyed being in the loop on the entire process. Working with Erin and Love Is Blooming was a great experiece for my daughter and I as we planned for her July wedding. Jenny’s wedding was going to be out of her home state and that added a bit of a problem as to how to pick out flowers from a distance. We both agreeded on silk flowers. She had in mind the color scheme and the style of bouquet she wanted and began an internet search. She came across the Love Is Blooming site and filled out the simple form provided on the site. Erin was quick in her reply and very attentive to her needs. They began exchanging emails to narrow down Jenny’s exact wants and needs. Within a short amount of time they had narrowed the exact flowers down. We placed an order and signed a contract. The prices were very reasonable and everything was handled very professionally. Erin was great to send her pictures of the flowers she would be using and always wanted to know if they met her approval in advance. We placed an order for corsages, boutonniers and bouquets. Throughout the entire process Erin would email us both with a progress report, as well as pictures. This was very helpful. The flowers arrived well in advance of the wedding and they turned our beautifully. Jenny and I would highly recommend Erin and Love Is Blooming for all your wedding flowers. Erin, words cannot express how satisfied I am with my flowers! I LOVE THEM!! I am amazed at how real they look! I have to admit, I was a little worried about having artificial flowers, but after seeing my arrangements, I know no one will be able to tell! Everything turned out just as I wanted it too! It was like you could read my mind! It is obvious that you take great pride in your work and go to extreme measures to make your arrangements as beautiful as possible. I am so thankful that you were able to work within my budget! It’s amazing how everything seemed to fall into place! I appreciate the photos you sent me of my flowers. As a full-time student and part-time employee, it worked out so well for me to be able to communicate through email! I also love the fact that I had my flowers in hand well before the deadline! I will confidently suggest you to anyone who is planning a wedding! Thank you so much for the wonderful job you did and for being so easy to work with! I know that God will bless you for the amazing work you are doing for your customers! Thanks for making a major decision in my wedding planning process so much easier! Hi, Erin! As I was writing this, I’m thinking that you may not want to publish it because you could be setting expectations way too high. ;-) I don’t know if you want to advertise yourself as the gem I see you as because you might get a hard-to-please bride coming along and expecting the earth and sky. ;-) But I do want to tell you how very much I appreciate the work you did for me, and you’re free to pick and choose from anything I’ve said about how awesome you are. ;-) I actually could have gone a little more overboard, but then I didn’t want to have it sound like you’re a miracle-worker (even if that is how I see you). :-) Thanks again so much for making our wedding flowers something I didn’t have to stress over - even from 1500 miles away. I want to thank you SO much for the wonderful work you did on the flowers for our wedding. Most people don’t think of Minneapolis as a “destination wedding” spot, but it was for us. :-) Bill and I live in Washington State, but most of Bill’s [large] family lives within driving distance of where he grew up, so it made the Twin Cities the logical choice for the wedding. That meant that I got to plan a wedding in a city I’d never been to! I was concerned in general about not being able to “see” the product and take an active part in the progress, so I looked for a vendor in my area who would work in silk and figured I’d transport the flowers to Minneapolis for the wedding. As it turned out, the vast majority of floral artists in this area work only with fresh flowers and there wasn’t anyone local who would do silk arrangements for me. So I looked in the Minneapolis area and found your website. You had a commentary posted from someone you had worked with long distance and she raved about your communication during the process. Was she ever right! You worked within my budget and let me know that certain choices I made would increase the cost and by how much - there were no surprises. You were so easy to work with, and the email communication was fabulous, sending me photos at every juncture (flower, color, and filler selection, construction). You asked questions and really paid attention to my feedback to make sure you captured the picture I had in my mind. It was a HUGE stress-reliever for this out-of-town bride! I so appreciate the care you took selecting flowers that coordinated and catered to my hopes and expectations. You’ll always have a special place in my heart for finding those blue irises when I thought I was going to have to do without! I don’t know that everyone would have gone to the trouble you did to find exactly what I wanted. I felt like you were investing in my wedding and that I was more than just a client to you. When I picked up the arrangements, everything was labeled and organized, so there was no guesswork as to what corsage went to whom, which arrangement was for which table, etc. It sounds like a small thing, but when I’m trying to pull together things from vendors with the limited time I had in town before the wedding, it was great to not have to worry about that detail and know that helpers could get the flowers to the table or person where they go without coming to me.